Meet Atia, Our Star of the Month! Atia is wonderful member of the sewing community and we are so excited to have her as our Star of the Month. If you’re not familiar with our Star of the Month campaign, then allow me to briefly tell you what it’s all about. Star of the Month is our way of shining the light on a wonderful member of the sewing community. It’s a way for us to celebrate those who make an incredible contribution and those who inspire us. Atia most certainly ticks all of those boxes! She’s a really lovely lady and her style is incredible. Every outfit is perfectly put together with lots of florals and bursts of colour. Her entire wardrobe is just joyous! One of the amazing things about Atia, is the way she contributes to challenging conversations. There have been many issues cropping up within the sewing community over the past few months, and I love how eloquently she discusses these topics. It can sometimes feel easier for us to stay silent about topics and issues, but Atia helps to break barriers and allows you openly and/or privately talk about these things. She’s a wonderful leader and if there was ever someone who I’d want to represent the sewing community, I’d choose Atia. She’s mindful, kind and genuine. I can’t think of better qualities. For all of these reasons and a million more, it’s an absolute honour to have Atia as our Star of the Month, and share this interview with you. I’ve been following @ruthpoundwhite’s #onlineactsofkindness this week and have found it really positive and inspiring, so this is my (slightly late!) contribution. I started posting on Instagram as a way of sharing the things I like, and gradually pushed myself out of my comfort zone. Along the way I have made so many friends spanning different Instagram communities, and met quite a few in person as well. I have shared successes and failures, the frustrations of being a working mother, my passion for making and my love of colour. I am still a work in progress, a project that can never be completed. So thank you to all of you who spend a little time with me each day, to learn more about what makes me who I am. 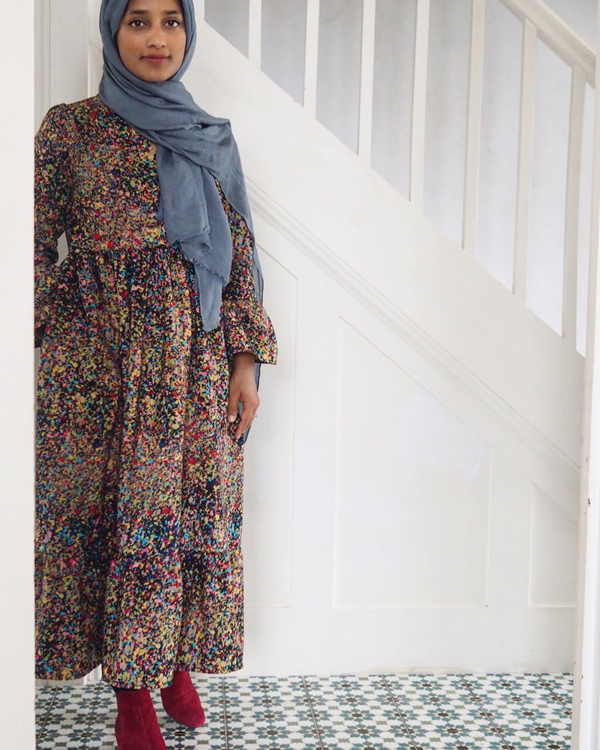 I sew for the enjoyment of making something with beautiful fabric and because it allows me to be creative with colour and adapt current trends to my needs as a hijab wearing Muslim woman. How long have you been sewing and how did you learn to sew? I have always been interested in sewing and did GCSE Textiles at school. I didn’t sew much again until I bought a secondhand Bernina when I was a junior doctor and learned from books and the Internet, and also did a dressmaking course at the local Adult education centre for a few months. When I was at school I made a wall hanging with an appliqued doll on the front. After starting again as an adult I made a quilted bag from Amy Butler’s “IN stitches“ book. Can we have a sneak peak of your sewing space? My sewing space is actually in the conservatory! It’s a nice bright room with space for patterns and notions, but not quite enough room for all my fabric! What do you do when you’re not sewing? I like to grow flowers and vegetables in my garden. I also enjoy knitting. I love your Instagram feed! How do you take such beautiful pictures? Thank you! I try to consider the colours and lighting carefully and always shoot in natural light. I use an Olympus Pen camera but used an old Nikon camera for a long time which gave similar results. I am inspired by friends on Instagram, and also sometimes fashion trends. You play a key role in the sewing community, supporting others, and highlighting inequality. It’s incredible and so inspiring. Would you like to tell us more about some of the issues you support? Are there ways we can support you, and others? I am always interested in highlighting inequality and how we can be more conscious of reducing our own impact, as ethical consumers. Recent discussions about being inclusive and the lack of diversity in the maker community has led to more openness which should be encouraged. I’m glad more people have been to come forward with their own stories. I’d like to encourage everyone to diversify who they follow and take inspiration from, using hashtags such as #sewincolour or my hashtag #inclusivemaker can help. Could you tell us about dressing modestly? Why it matters to you? How do you do it with so much style? Are there certain pattern designers you tend to go to, or do you adapt patterns to suit you? Like many Muslim women, I believe dressing modestly is part of my religion and not something I want to compromise on. I look for comfortable styles which don’t require significant modification. I like to mix pattern and colour and am fond of ruffles! I think well fitting garments are essential, especially if like me you are petite. I use patterns from many different companies but I like using grainline studio and Ikatee couture patterns. What’s the next thing you’re planning to make? I really want to make a button down cord pinafore and a Wiksten Haori jacket soon. Thank you Atia! It’s been wonderful getting to know more about you. I’m so excited to see your next makes and continuing to follow your sewing journey. If you don’t follow Atia already then I highly recommend checking out her Instagram feed. You’ll find the most beautiful collection of florals and handmade clothes. Atia’s photos are just dreamy. Meet Louise, Our Star Of The Month!